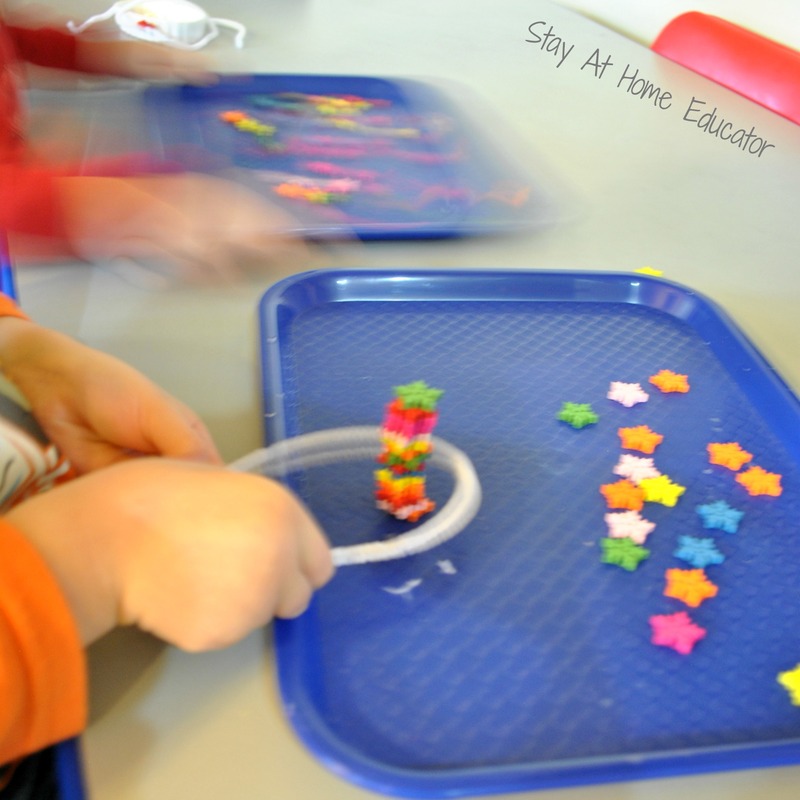 Setting out an invitation to play is a wonderful way to encourage preschoolers to explore and manipulate a set of materials. 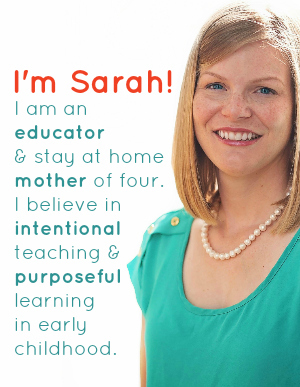 Recently, I offered my preschoolers a snowflake themed invitation to play to parallel our studies in winter theme. 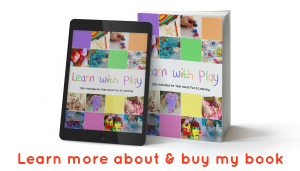 An invitation to play is a set up of play materials that are offered to a child to play with and use as he chooses. It is completely open-ended play with absolutely no targeted end task. 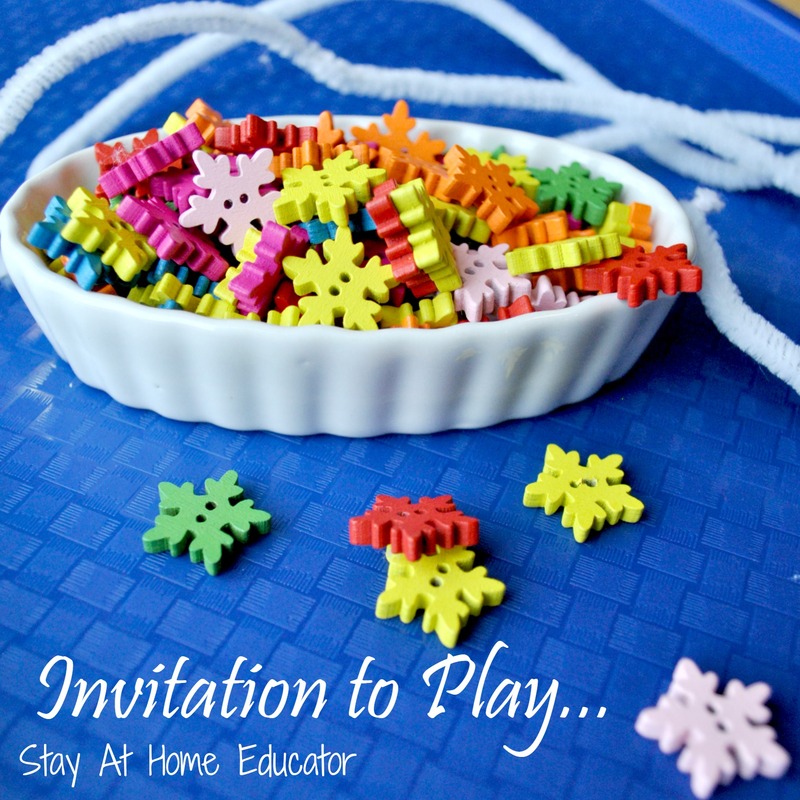 In this invitation to play, I offered a ramekin full of wooden snowflake buttons and a few chenille pipe cleaner stems on a tray . 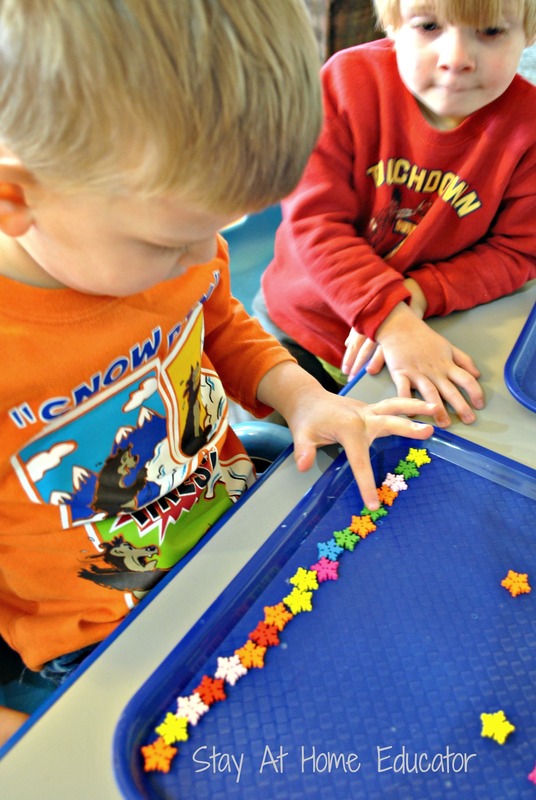 When inviting my preschoolers to come and play, I simply pointed out during centers that there was a new option available, but by no means expected all the children to participate. Each did, though. 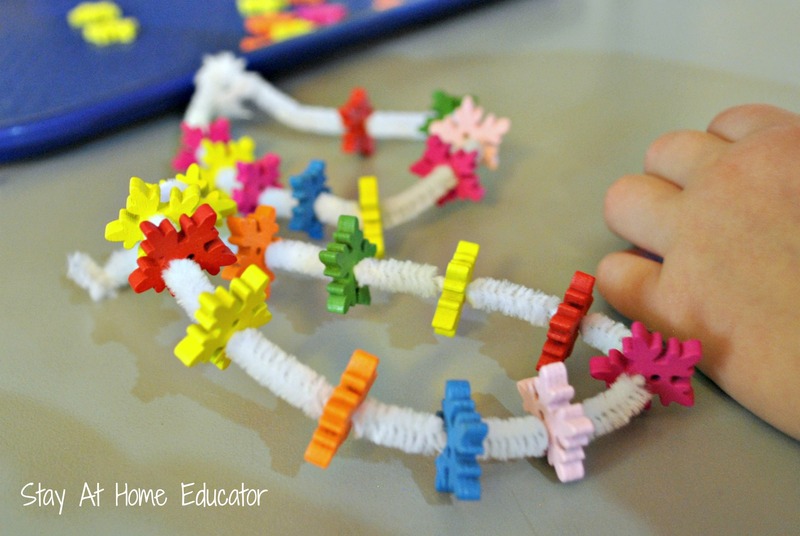 While this snowflake themed invitation to play may seem very basic, the exploration and discovery that took place was incredibly creative and valuable to my student’s education. On top of that, it kept some of my students directing their own learning, and yes, they were certainly learning, for the better part of an hour. The bar was set high for only some buttons, a ramekin and some pipe cleaner. Let me walk you through what took place. One student started his play by stacking the buttons. Since they are wooden and without embossing or extra embellishment, they have a flat surface making them perfect for stacking. This student wanted to see how tall he could build his snowflake tower. These buttons are less than an inch in diameter, so stacking them was a fete of dexterity. Once Corinne was convinced the two boys are satisfied with her correction of the pink snowflake buttons, she returned to what she was previously doing, beading the buttons into the pipe cleaner stems. Due to the small diameter of the buttons, the button holes were rather small. Not too small for the chenille stems, but the fuzzy chenille limited her view, and she became frustrated. As her teacher and mother, I encouraged her to keep trying. This was an important lesson in perseverance. I knew Corinne was plenty capable, if she could get past her initial frustration that these buttons were a little more difficult than others she had used. After a little more effort, and some help from one of her classmates, she ended up with two snowflake beaded bracelets. She wore them around her wrist for a short time while she stacked the remaining buttons on her tray. But, getting some inspiration from a classmate, she took them off and tried to shape the pipe cleaners into squares, triangles, and ovals. The friend sitting next to Corinne continued to build his towers, but noticing they kept falling and scattering all over his tray, he tried to use a pipe cleaner stem to create a barrier to keep them from dispersing all over and “making a mess.” In the background of the photo below, the other little boy moves his tray back and forth, watching how the buttons seem to stay still despite his moving the tray rather vigorously. In addition, he mentioned the sounds the buttons made as they slid on the tray, and how it was different from the sound they made when they fell. While that student who wanted to create a barrier was problem solving, (he tried several different approaches), Corinne discovered that the buttons could stand up on their own. So, she set to work lining them up. At one point, she named a few and used them as props to retell the story The Snowflake Sisters , a book we read earlier that day. “There it is! A pattern will repeat itself and do the same thing over and over again. Do you want to continue the pattern? How could you make it right?” He looked at me for a moment, then carefully selected only a few buttons to remove. I continued to acknowledge his problem solving and encouraged him to keep going. But I did not hover above him. Instead, I allowed him time to work as I looked in on Corinne’s play. The student continued working playing on his own. He named the button colors again, then removed a few more buttons. Named them once more, then removed a few more. He was processing. He was problem solving. He was thinking and not just acting. By not stepping in to correct this boy’s mistake, he was able to think through the problem to design a solution of his own, which is far more valuable than me giving him specific guidelines (although there is a place in teaching for directing and modeling. This just wasn’t it). Meanwhile, the little boy who stopped to watch, had returned to his tray. He began making his own pattern and beamed when he read it. He read his pattern again and again, equally pleased each time at his accomplishment. This invitation to play could not have turned out better! Writing this post was so enjoyable as I was able to look back at the pictures and reflect on the learning that took place. Not the teaching, the learning. The open-ended use of the materials served as such an appropriate vessel for learning, as the students directed their own learning, and in many ways taught themselves. I want to point out that while most teachers and parents may have looked at these materials as a way to teach color sorting (and they are), that is not at all what the students learned from them. Instead, this group of three year olds who took very basic and otherwise unexciting materials to manipulate, arrange, rearrange, organize, reinvent, distinguish, illustrate and so much more. 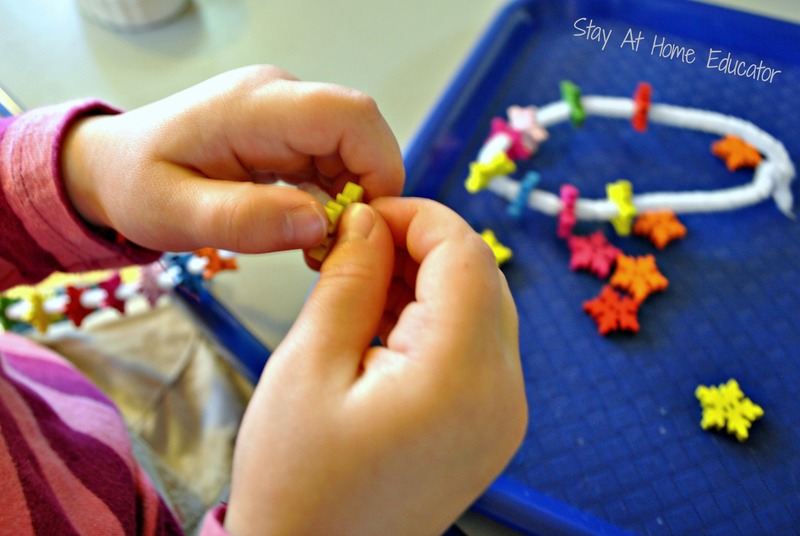 This lesson is a pure example of how children’s work really is play. What a beautiful explanation and illustration of learning through play! I love it! where did you purchase these buttons.I am assuming you got them bulk. There is a link in the post, but I got them from a vendor on Amazon. They were crazy cheap, but I would recommend getting more than one package if you are teaching preschool. 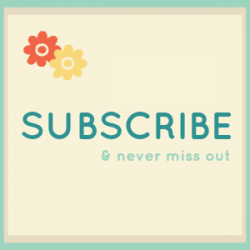 I have one package for each student and that allows the students to really explore.